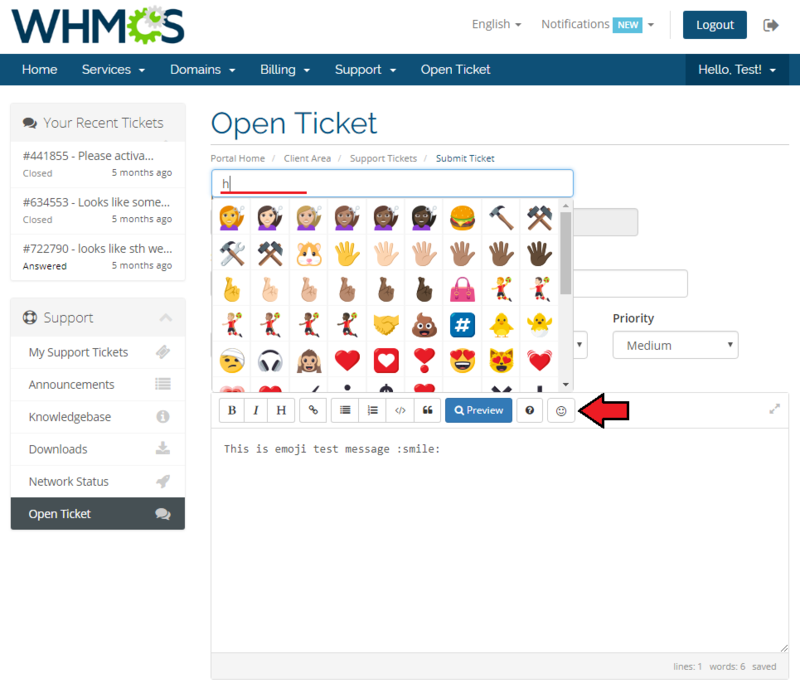 Emoji Picker For WHMCS will let both your clients and support teams add emojis to ticket conversations. You will be empowered to choose support departments that should display emojis and decide whether these symbols shall be visible in the admin area. The module also provides support for emoji domains, allowing conversion of your clients' domain names from a Punycode format to emoji artworks. 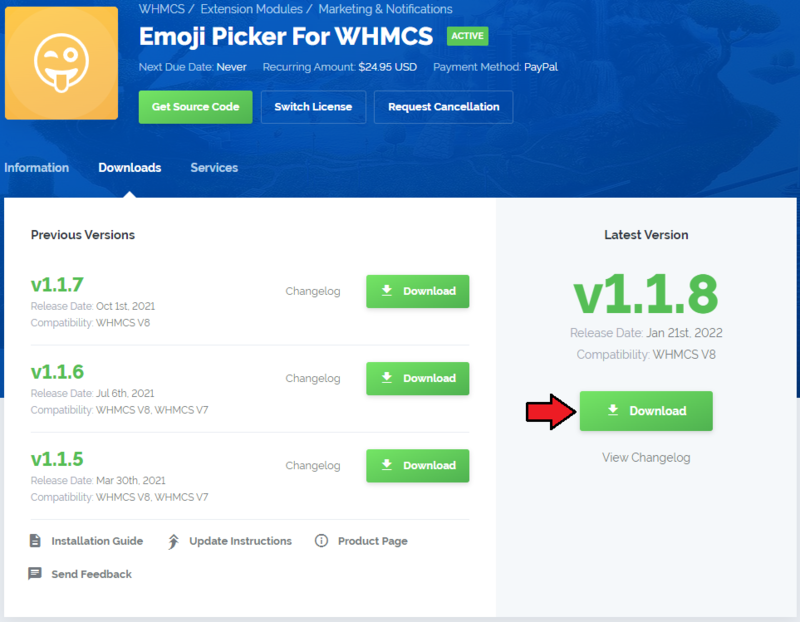 This tutorial will show you how to successfully install and configure Emoji Picker For WHMCS. 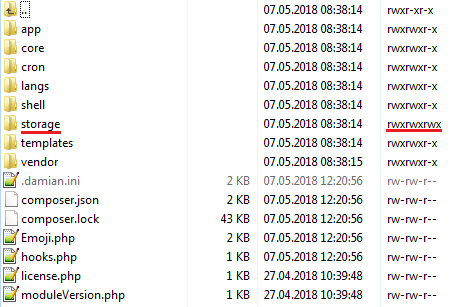 The content of your PHP version files should look like this. 4. 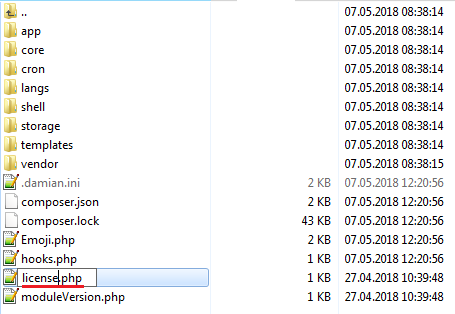 When you install Emoji Picker For WHMCS for the first time, you have to rename the 'license_RENAME.php' file. This file is located in 'yourWHMCS/modules/addons/Emoji/license_RENAME.php'. Rename it from 'license_RENAME.php' to 'license.php'. This folder is available at 'yourWHMCS/modules/addons/Emoji/' . Afterward, find 'Emoji Picker' and press the 'Activate' button. 9. Congratulations, you have just successfully installed Emoji Picker For WHMCS! Now you need to configure your newly installed module. 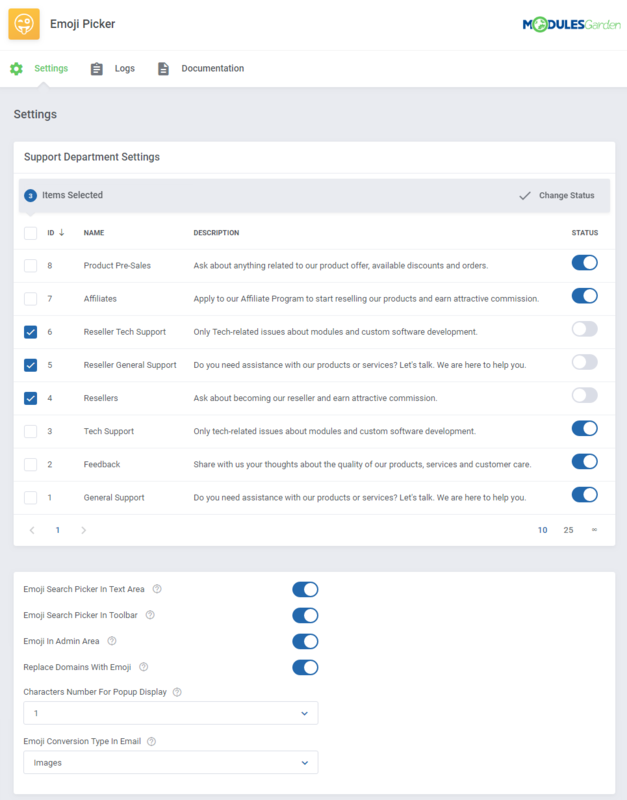 Support Department Settings - choose which of your support departments will display emojis. 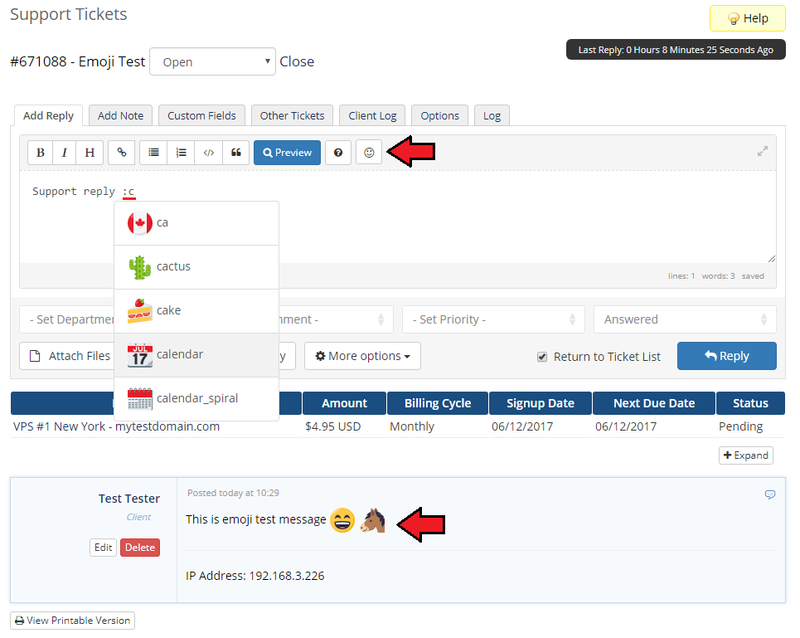 Your clients will be able to use emojis while creating or replying in tickets, as well as view emojis in email notifications. Note that you can change the status of multiple departments at once by using mass actions. Emoji Search Picker In Text Area - if enabled, the emoji popup will be displayed when entering the emoji code in the ticket. Emoji Search Picker In Toolbar - if enabled, the button with emoji search picker will be displayed in the ticket editor toolbar. 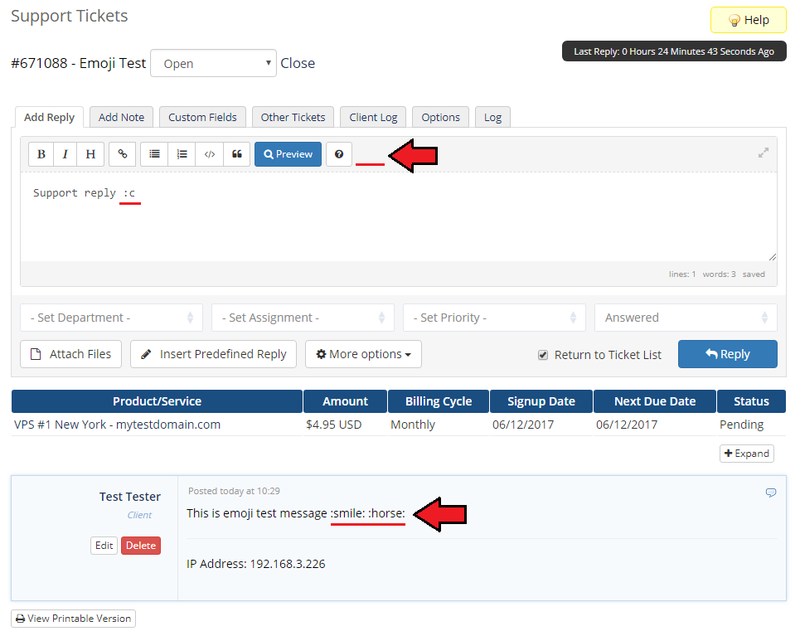 Emoji In Admin Area - toggle on if you want the administrators to view and use emojis when creating and replying in tickets. If disabled, they will be visible in the admin area only in the form of emoji codes. Note that your support can still type remembered emoji codes which will continue to be visible as artworks for your clients. Replace Domains With Emoji - toggle on if you want to have support for emoji domains. Note that this will also convert Punycode to the unicode emoji in the domain-related emails as well as on the HTML invoices. Characters Number For Popup Display - specify the minimum number of characters that are required after the colon in order to display the emoji popup. E.g. if set to '0', emoji picker will be displayed immediately after entering the colon character. For '1', only first emoji character will have to be entered after the colon etc. Note that 'Emoji Search Picker In Text Area' option must be enabled for emoji popup to work. E.g. if 'Images' selected, emoji picker will be converted into an image in an eamil message. If 'Unicode', has been selected the emoij will be converted and dispalyed as such in an email message. The logs provide data about particular domain orders, invoices or email massages to which emojis have been successfully applied. The section also includes information concerning any existing errors. 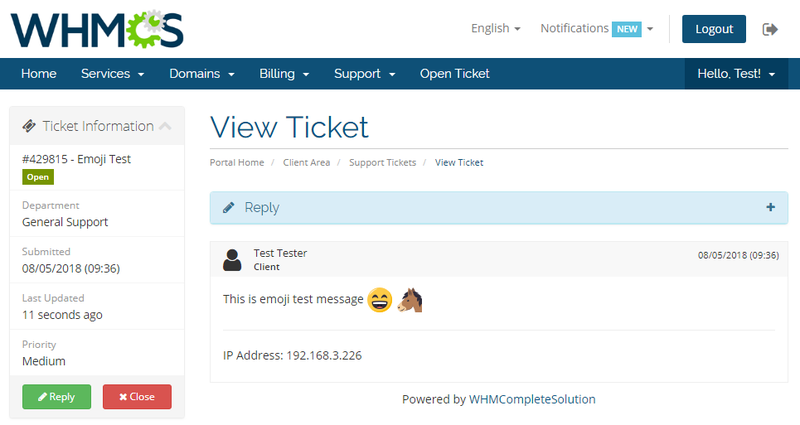 Once Emoji Picker For WHMCS is installed and configured, you can use emoji in tickets as well as view them in domain names instead of a Punycode format. 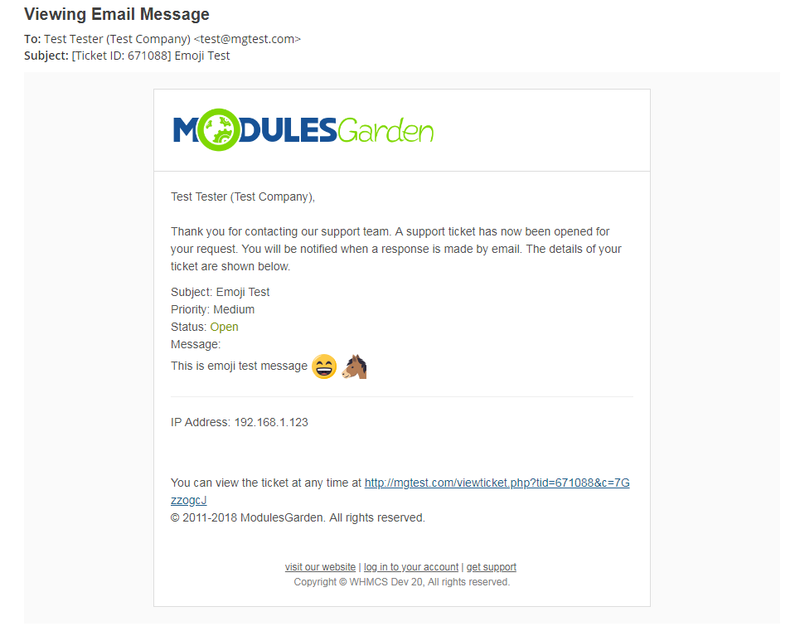 In the client area, you can use emojis in tickets submitted in any of support departments with enabled emoji support. When you compose a message and the 'Emoji Search Picker In Text Area' option is enabled in settings, you can insert emoji by pressing : (colon). This will display a list of available emojis depending on the 'Characters Number For Popup Display' setting. Continue typing the name to search for the desired emoji. When ready, click on the chosen emoji to insert it or simply end its name with : (colon). You can also view, browse and search through all available symbols by clicking on emoji picker if the 'Emoji Search Picker In Toolbar' option is enabled in settings. When the composed massage is sent, the inserted emoji codes are replaced with emoji artworks. This also applies to the tickets-related email notifications. Underneath, there is an email notification view with 'Images' selected as a conversion type of emojis in emails. Here you can see a standard email notification with 'Unicode' selected as a conversion type of emojis in emails. If you have the 'Emoji In Admin Area' option enabled in the addon settings, your support administrators can view and use emojis in their tickets as well. Note that the 'Emoji Search Picker In Text Area' and 'Emoji Search Picker In Toolbar' options are also applied for this area. Otherwise, your support administrators will not be able to enter emojis, neither they will see them as artworks in messages. The module can convert domains in the Punycode format to emoji domains. 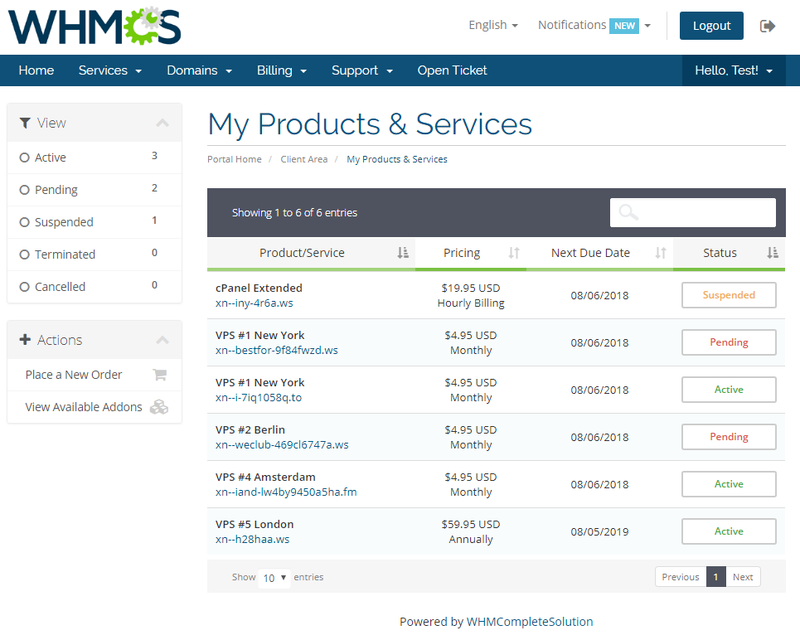 This applies to client area domain lists, service lists with domains, their details, as well as HTML invoices and email notifications related to domains. Important: Read the second point of common problems section explaining WHMCS problems with registration of emoji domains. For example, WHMCS displays a list of emoji domains in their original Punycode format by deafult. When you enable the 'Replace Domains With Emoji' option in the addon settings, the Punycode will be replaced in the client area with the emoji format. Note: The domains use unicode emoji, not the graphical artworks as presented in tickets. This means that their appearance may differ depending on the web browser. 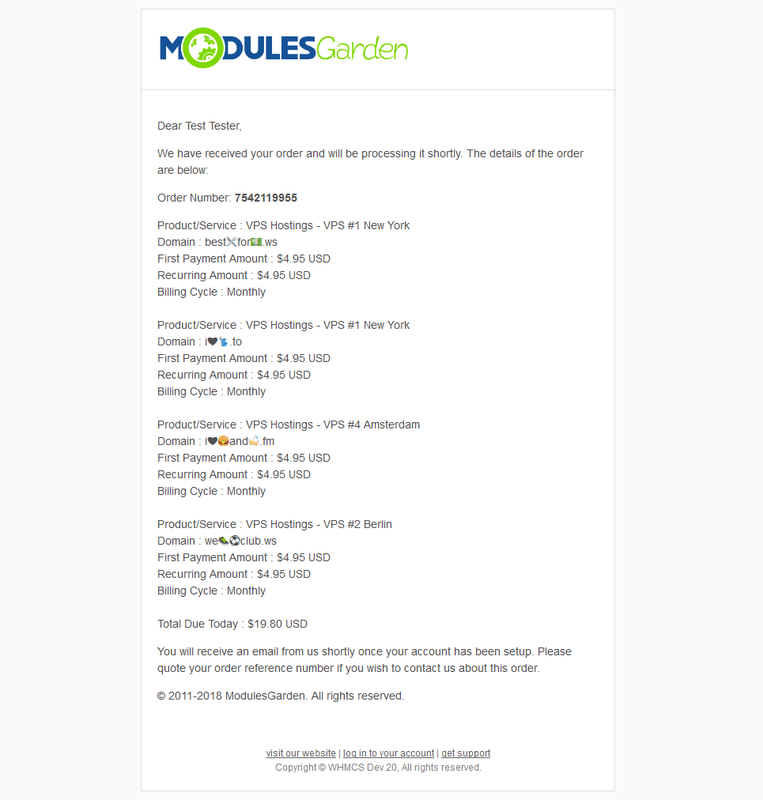 The same goes for HTML invoices. 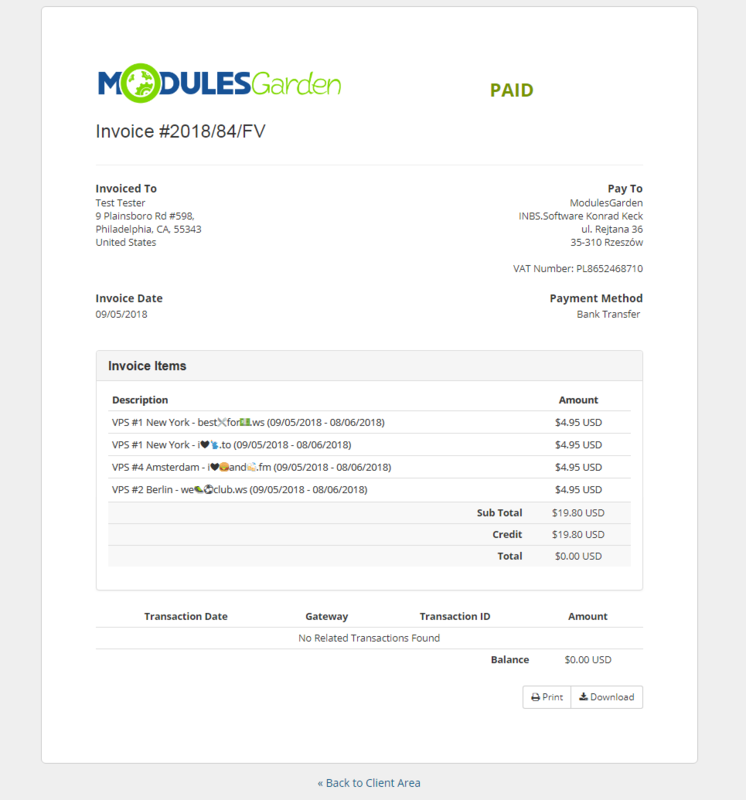 Note: Currently, the domains on the PDF invoices will still be shown in the Punycode format. 1. 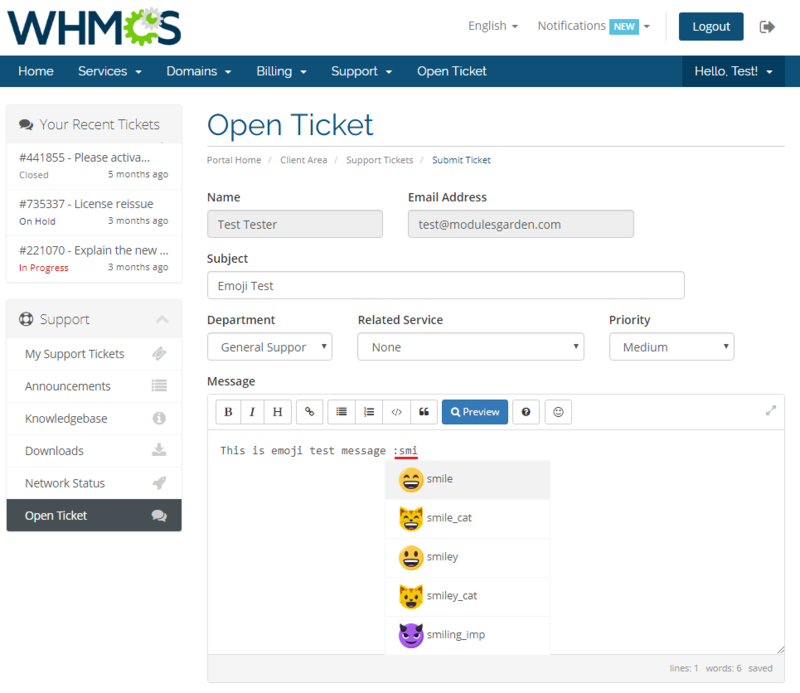 The module supports only the WHMCS built-in ticket system. 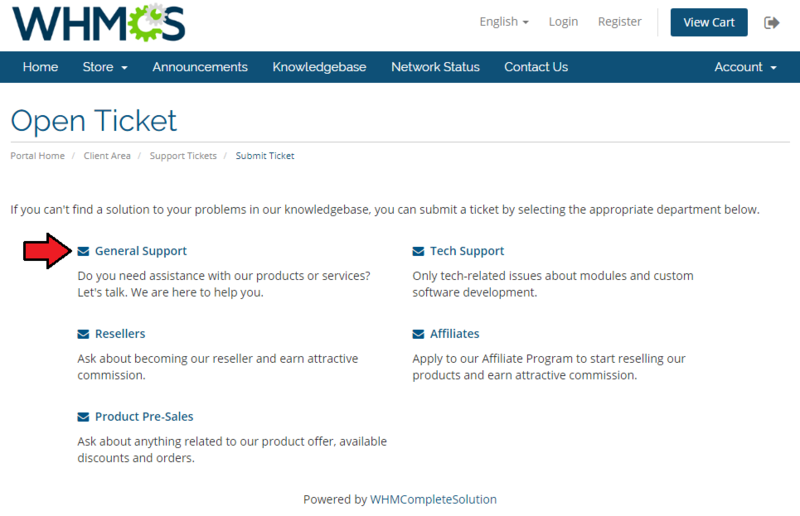 Separate ticketing systems such as Zendesk, Kayako, Freshdesk etc. are not supported by this module. 2. 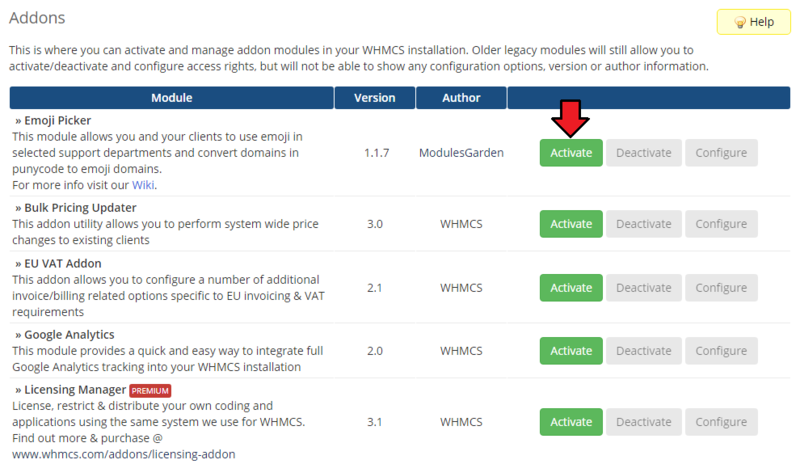 If you plan to use emoji domains, it is recommended that the 'Allow IDN Domains' option is enabled in your WHMCS general settings. 3. The feature of replacing domains with emoji works only for the client area. In the admin area, these domains will be still displayed using Punycode. 2. This module does not fix the problem of broken emoji domain registration system occurring directly in WHMCS. 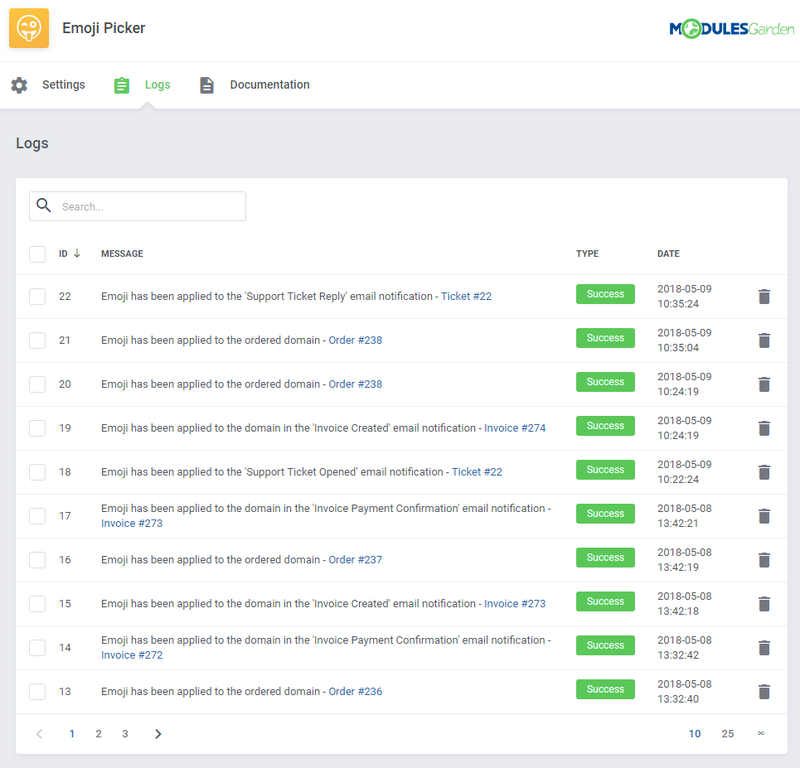 It is due to WHMCS solely that the registration attempt of a domain with emoji artworks or with emoji already converted to Punycode is automatically cleared from the 'Domain' field after placing an order. Our module only converts the already properly applied Punycode domain into emoji (e.g. when a client uses the existing domain for their service or the Punycode is placed manually into the domain field by the administrator). 3. The 1.0 version does not replace the domain Punycode format on PDF invoices. This feature works only with HTML invoices for the time being. 4. In the WHMCS versions prior to 7.5, the emoji domain replacement will not work on the order summary, and the domain will still be diplayed in the Punycode format there. This is caused by lack of a required WHMCS hook. 5. It may turn out that when you preview an email in the WHMCS client's profile in the admin area, the message is suddenly cut off at the point where the emoji domain name should start. This is a WHMCS bug and despite this inconvenience, the message itself is sent to the client correctly. 6. 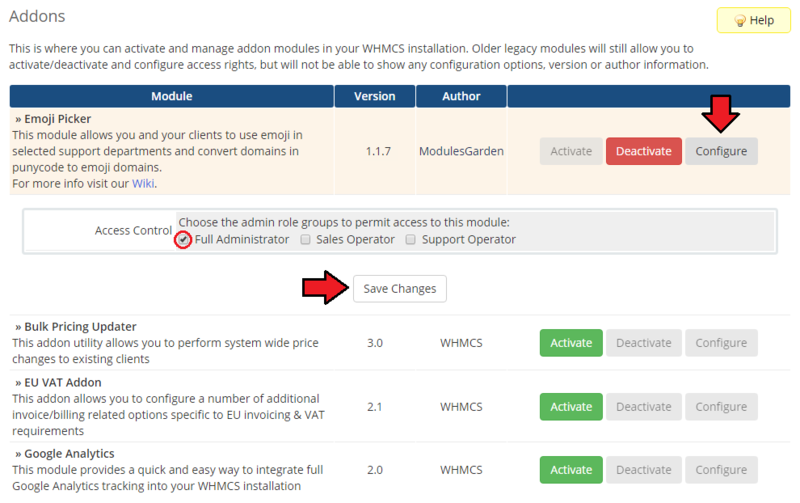 Emoji Picker For WHMCS is currently not compatible with Multibrand For WHMCS or Resellers Center For WHMCS modules. Do not use these products together. 7. Unicode conversion type in email may not be visible in the email preview in the client's profile in the admin area. 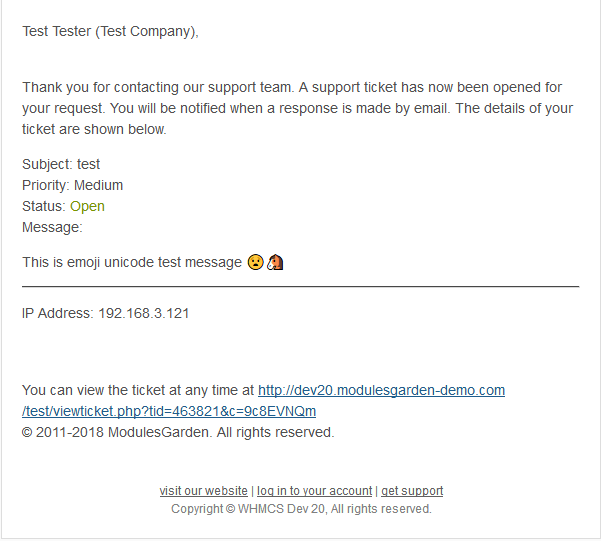 Currently, unicode type emojis are visible for clients only in the message they receive.